Usually when I go out with the trampey club, it’s on overnight and weekend trips. The club runs many daywalks around the Wellington region too, however, and I thought I might join in for a particular walk that Darren was organising up Mt McKerrow in the Rimutaka Range. I did exactly the same thing back in 2007 , with a different group of people. 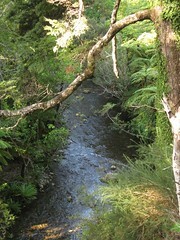 Location: Rimutaka Forest Park, Catchpool Valley entrance. 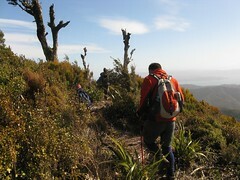 Route: Along the Orongorongo Track, up to Mt McKerrow, then down Clay Ridge. 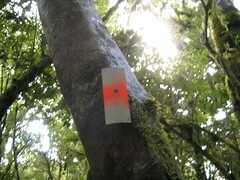 We left about 10am, following the Orongorongo Track for about an hour to the base of the McKerrow Track. The Orongorongo Track climbs by about 70 vertical metres over this time, but it’s not very noticeable and it’s an easy walk. There are several side-tracks off both sides, one of which is Browns’ Track, and is not officially maintained although it’s still used — it’s a handy (though potentially steep and slippery) way up to Cattle Ridge, and then down to the Orongorongo River on the other side. I made a note to look for this because I’ve tried to find it several times in the past without luck, and happily on this occasion it stood out really well. I marked it in my GPS and on the attached map so maybe I’ll find it more easily next time, but it’s also marked with a broad piece of ribbon. It took a couple of hours to climb to the summit of Mt McKerrow. The summit itself is a five minute walk past the top of the Clay Ridge track, which we intended to walk down. At roughly 700 metres it’s still under trees and ceremoniously marked by a drainpipe poking out of the ground. It here that we sat down for lunch at about the same time that a chap came wandering up from the Wainuiomata direction to the north. 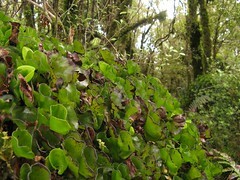 He commented on another track that was supposed to be near here, which he’d not seen, leading down to a scout camp on the Wainui Coast Road to the east. I checked my 2006-published LINZ map which implied that such a track should be leading down a spur to the west, almost straight off the Mt McKerrow summit, but there was no sign of anything apart from a short 2 metre track to a possum track. A quick look around and bashing through the nearby scrub still didn’t find anything that looked to be a likely track, and we abandoned the idea in favour of heading further north along the obvious track, hoping to find some nicer views. And there were a few places where the track emerged from the trees, making it possible to see a long way over East Harbour Regional Park to Wellington Harbour, and also north to Wainuiomata. 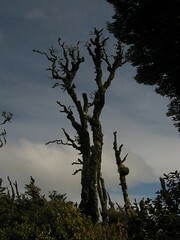 west of the Mt McKerrow summit. Some people continued to wander further down, but I didn’t feel like coming all the way up again, so I abandoned that idea and returned to the McKerrow summit to wait, at which point I resumed looking for this elusive track entrance. And eventually, I found it. Contrary to first visual impressions, the track does head west almost directly from the McKerrow drainpipe. It appears to fade out after just a few metres, but there’s still a faint hint of a track that winds around a little, and 60 metres away (at least according to my GPS), I found an old Forestry Service white rectangle nailed to a tree. Someone’s tied a ribbon to another tree a few metres behind it, so it seems this track is probably still used enough that it’d be reasonably walkable. (Certainly nothing like the standard of the other tracks in the area, and it was already quite boggy, but sometimes that’s a good thing.) From what I could see it appeared to be curving around to be on top of the spur it supposedly went down, which shouldn’t be much of a surprise. I marked the location of the marker as another waypoint, and that’s the waypoint showing near the top of McKerrow in the attached map. Perhaps I’ll return here at some point to see if I can follow it properly, but it wasn’t part of the plan today. We left around a quarter to two. Darren out in the open. From McKerrow, we headed back to the track junction 5 minutes below, at the top of the Clay Ridge Track. Shortly after we began to head down, the trees opened up and we were suddenly walking right along the ridge, far more exposed and able to see a long way once again, at least for about a minute. These were probably the best viewing points of the day. Clay Ridge is comparatively steep in places, though nothing frightening and it’s completely doable. It’s actually a really nice walk. Near the bottom (90 minutes later), Clay Ridge track splits into three. It’s possible to either keep going straight ahead over the last part of the ridge, go south-east and connect back to the Orongorongo Track, or go west down the side of the ridge, and walk along the river at the bottom. All three options can end at the same place (the carpark), and for whatever reason we chose to turn right, and follow the western path down the ridge. From here it was a 20 minute coast sidling above a nice river valley, on a good track, back to the Catchpool Valley carpark.